Sam’s Paving, Inc, is a top commercial paving contractor serving Harford, Cecil, and Baltimore counties. With hundreds of satisfied commercial clients, you can be assured that your next parking lot project is properly managed. We are experts utilizing the best materials and offer the most competitive rates for asphalt paving installation services. We will thoroughly examine your job site and make the best recommendations for your needs. Every parking lot we install adheres to the best industry standards. We utilize the best asphalt mixtures to ensure your parking lot will last for years to come. With great attention to detail we ensure that each parking lot is properly line striped for the proper parking of your customer’s vehicles and premium curb appeal. We also resurface existing parking lots. The life of a parking lot can vary dependent upon traffic patterns, weather patterns and proper maintenance. We recommend the resurfacing of a parking lot in the Baltimore region every 7-10 years for commercial sites and between 5-7 years for sites with heavy truck traffic. It is important to perform routine maintenance and inspections of your lot to ensure the longevity of the lot and the safety of your customers. During inspections take note of depressions, cracking, and potholes. If these are an issue, resurfacing may be a cost effective solution. Commercial paving and maintenance. Eventually, all asphalt pavement must be replaced. 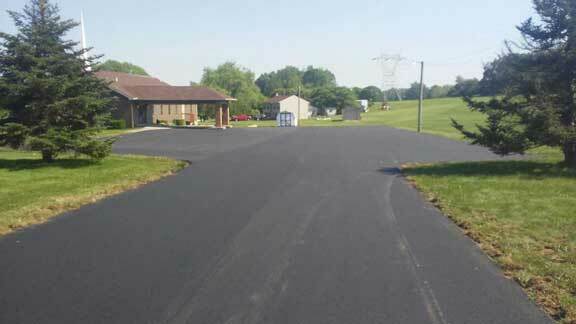 However, you can extend the life of your asphalt lot with a consistent maintenance program including sealcoating. The application of sealcoating can increase the life of your asphalt pavement and save up to 300% over the course of 15 years. If you’ve had a new parking lot installed in the 1 – 2 years, we recommend a fresh coat of sealcoat. It’s a preventive against deterioration, and it helps revive the look and curb appeal of older surfaces. The biggest issues for your parking lot is the rain, sun, oil and even oxygen – all which speed up the aging process and contribute to cracking and potholes. It’s a small investment that leads to huge savings. Sealcoating provides curb appeal. Black pavement and stripped lines give your customers a good first impression of your business. The forces of nature. Sealer coats and seals the porous asphalt surface preventing water penetration and oxidation which are caused by UV rays. Damage from traffic. Gasoline, oil, rock salt and other chemicals can erode your pavement. Smoother surfaces. Seal coating will help keep your pavement surface smooth, lowering your operational costs for cleaning, maintenance, and snow and ice control.